Thanks to my parents' green thumbs, I now have sitting on my counter a giant box of heirloom tomatoes, eggplant, habaneros and green peppers — but a manageable amount to consume in a reasonable amount of time. But of serrano peppers, there's a serious surplus. We've used them in guacamole and sauteed them with garlic and other peppers. Anyone have any other good suggestions for using up a serrano surfeit? Nice one. I just got my grandmother's gazpacho recipe today. It calls for Tabasco so maybe I'll try subbing it. What about roasting the serranos and then either storing them in oil or the freezer for future use? Agree with the "roast them" comment. A drizzle of olive oil and sprinkle of salt, into the oven on about 450. After they're mostly black, take them out, drop them in a zip lock bag and let the steam loosen the skins. After a little while, taken them out, remove skins, stem, seeds, etc. then drop in a jar and cover w/ good olive oil. 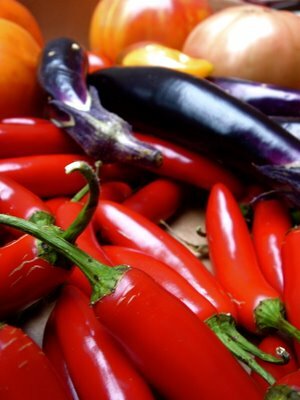 A number of Thai recipes can use serranos interchangably with Thai chiles. I use them in making Chicken or Beef Kaprow - Garlic chiles, soy, fish sauce, sugar, your meat, stir fried with a handful of Thai basil thrown in at the end. Thinking this might be serrano week: make some Thai dishes a la Bilrus one night, mix up some gazpacho another night, and roast the leftover peppers to use later. Thanks all for the ideas. why not make your own siracha? seems like that would keep in the refrigerator for a while. slit your seranos lenghtwise, add an equal amount of ginger juliennes and an equal amount of lemon cut in eights, dredge with a LOT of salt and place in a clean glass jar. Place jar in the sun ( with the lid off) or a warm spot in your kitchen for afew days and you will have a good pickle which can last at room temp for along time. Beef kaprow last night! Thanks, Bilrus. I can keep it for a Bloody Mary bar!